Jane Gaze -Sculpture by a Scottish artist inspired by the historic textiles industry in Hawick, using the vernacular Keeking Glesses "tae keek at oorselves". The ancient settlement of Hawick was sited at the confluence of the Teviot and Slitrig waters. In common with the other major towns of the Scottish Borders it harnessed the power of the rivers to drive mills producing woollen cloth and garments and established a worldwide reputation for its quality goods. I was fortunate to be employed as Artist in Residence at The Heart of Hawick, the Region's largest regeneration project. I worked with young people in the town and created a permanent public artwork entitled “Oo”, the dialect word for us, me, and we, it can be seen at the entrance to he Heritage Hub. 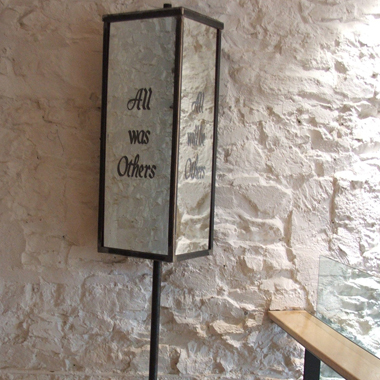 In Tower Mill there are two “Keeking Glesses”, unlike the vernacular glesses in the town they are self-reflective, and the proverbs inscribed on them are meditations on mortality.